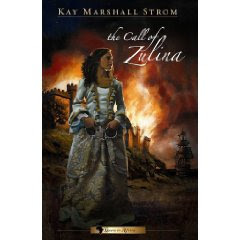 Tell us a little about your book: The Call of Zulina is the first book of a three-book saga. Set in West Africa, it centers around Grace Winslow, whose mother is African royalty and her father a British sea captain. Trapped in a marriage arrangement with a pompous, offensive white slave trader, she flees from her home and ends up in the middle of a slave revolt at Zulina slave fortress. There she comes to understand the horrific nature of her family’s involvement in the slave trade. She is forced to choose a side—slave or slaver. How did you come up with this story? In West Africa, I toured an old slave fortress and was struck dumb by a set of baby-sized manacles bolted to the wall. Right then this book began to germinate in my mind. Then, while I was researching Once Blind: The Life of John Newton—a slaver turned preacher and abolitionist, and author of the hymn Amazing Grace—I virtually “met” a couple who ran a slave business in Africa in the 1700s. I couldn’t help but wonder, “If they had a daughter, who would she be? English or African? Where would her loyalties lie?” That imagined daughter became Grace. The characters of Lingongo and Joseph Winslow, her parents, are modeled after that real-life couple. What did you enjoy most about writing this book? Delving into the history. It was astounding and confounding! What did you like the least? The horror of this episode of history. I suppose there is a reason why we gloss over historical hard spots, but of course salving our collective conscience doesn’t make the truth go away. First: Having one foot in each of two worlds and not quite belonging in either is a common feeling, especially for Christians who are “in this world but not of this world.” I would like readers to see the power of taking a stand, even though there are consequences for doing so. The consequences of fence-straddling are far greater. Second: Slavery is a blight on humanity that must be addressed. There is more slavery in the world today by four-fold than there was in the 18th century! Time for 21st century abolitionists to get to work! What helps you relax despite looming deadlines? We have a great hot tub spa, and I love to relax in it—read or talk to my husband or do nothing at all! I also walk and enjoy the changing of the seasons. And I like to play tennis and bowl and golf via Wii! Briefly take us through your process of writing a novel—from conception to revision. I am a pretty organized writer. Conception is no problem—my idea file is bulging! I gather info, then I make a fairly detailed chapter outline and attach all my research to the appropriate chapter. (This is a time-consuming step, but the better I do this, the easier and more trouble-free the actual writing.) Then I write a first draft: no corrections, no rethinking—just pouring it out. (I love this step!) Then I write a second draft: bringing order to the first, rewriting, switching info to another chapter, etc. (This is the painful step.) Then I do a final draft: polishing, fixing, double checking info. I move away from the project for a week or two and do something completely different and my husband reads it and makes corrections and suggestions. (He’s great!) I consider my husband’s comments, then I go back and reread the entire manuscript out loud one last time. Tell us what we have to look forward to in the future. What new projects are you working on? I have two more books coming out in this series. One is written (set in London) and I’m just starting book three (set in the new United States of America). I have also been approached about possibly going back to Sudan and writing the story of the displaced Southern Sudanese going home again. But I’ll have to say, after writing four books this year, I need a bit of a breather! Do you have any parting words of advice? I love the idea of fiction with a purpose. My prayer is that when readers finish The Call of Zulina – then when they finish the complete Grace In Africa series—they will long to see slavery wiped from the earth. And that they will be willing to be an active part of accomplishing that.